Description: Made from 600D Polyester. Features an open main compartment, media pocket under flap with access to earbud port, side mesh pocket and pen loop. Supplied with business card stitched on bag. Available in 2 colours. 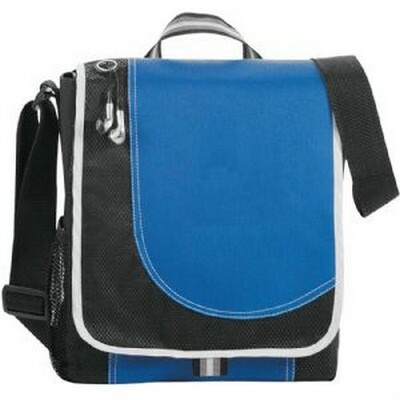 Features: Contrast pen loop and carry handle and adjustable shoulder strap. Packaging: Polybag. Colour: Blue and Black with White Trim. Material: 600d pc Product Size: 280mm(h) x 240mm(w) x 80mm(d). Freight details : 50 per carton, 11.2kgs, 35 x 33 x 48cms; Decoration Type(s): Colour Print / Embroider / Full Colour Print. Decoration Area: Screen: 120mm(w) x 100mm(h). �Embroidery: Centred on front pocket: 120mm Dia. �Other Methods: Contact your decorator for applicability and size. Price includes : 1 Colour Print. Setup is included.